It's time for me to start posting Halloween stuff!!! I have a bunch of it to post before Halloween actually happens, so let's get into it! 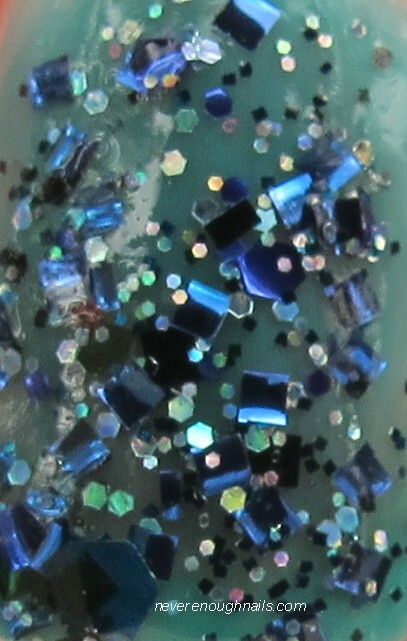 Lynnderella NightShade is a new polish from her Early Halloween Resurrected collection. Once again, Lynnderella's own description of this polish is so good, I have to quote it here: "NightShade has an overall appearance of navy, but contains assorted dark shades and vivid black holographic sparks that give the appearance of numerous red eyes in a very dark forest. Clear base." I LOVE the concept of little red eyes peering out of a dark forest!! Fantastic! NightShade is very unique in my collection. I don't have any navy-looking glitters and I love it! I felt bad for hating on Zoya Frida a few days ago, so I decided to use it with NightShade to make a spooky sandwich. I think Frida is absolutely perfect as a sandwiching polish and it works really well with NightShade! This is one regularly applied coat of Lynnderella NightShade and one dabbed coat of NightShade. Dabbing was the best application method for NightShade. Lynnderella's new collection is going two for two for me personally. The two I've tried so far (this and UnDead Red) have been unique and ridiculously beautiful. Early Halloween Resurrected is available now on Lynnderella's eBay store, and she's also announced that she'll be showing the Holiday collection sometime after Halloween!! GASP!! These glitter pieces together look amazing! They do, Emalitsa! This combo is very unique! I'm wearing NightShade on my nails right now! It is absolutely stunning! I am in love with it! Mine is over a faded dark navy! Oooooh that sounds cool Bridgette!! What polish is it over? Faded dark navy sounds like I need it LOL!